A third film version of Jimmy the Kid? DEW: What do you mean, two movies of JIMMY THE KID? If I knew how to ubderline [sic] on this despicable machine, I would underline ‘two’. Pretend I did. TAR: According to the Internet Movie Database, there is the Gary Coleman version and a 1999 German version. If their information is up-to-date, it hasn’t gone into general release yet, it’s just doing the film festival circuit. I managed to find some stills from it somewhere–they are on my site if you dig deep enough. Does this mean they didn’t pay you? DEW: Yes! They paid me in 96, and I haven’t thought a thing about it since. I’ll look for the stills. Knowing that Mr. Westlake thought the German version was the second one, you can imagine my surprise when I discovered yesterday that there appears to be a third film version of Jimmy the Kid, which would actually be the first adaptation. It was a 1976 Italian take. I can understand that by 1996, with dozens of titles under his belt, Westlake was far beyond caring about the details of selling film rights for one book or another. But did he forget about a film made from one of his books in 1976, only sixteen years after his first success? I find that hard to believe. My guess is he didn’t know this film was made. I would also venture a guess that he didn’t get paid for it. I stumbled across the existence of Come ti rapisco il pupo while looking up Dortmunder in Wikipedia. That might not sound like great detective work, but no one has mentioned this to me in the eleven years that this site has existed in one form or another. A Google search yields Wikipedia, IMDB, and nothing else in English. The IMDB entry is scant–it credits Westlake but makes no reference to the work the film is based on. Is it Jimmy the Kid? Despite the poster looking more like a Tatum O’Neal flick than a comic crime caper, I think it is. I also tracked down some stills, which are below the fold. They also fit the profile. 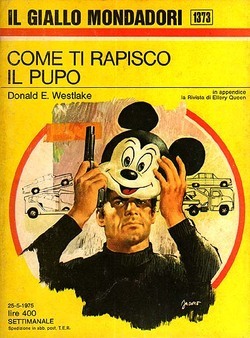 If anyone can get me a copy of Come ti rapisco il pupo in any format, I may be able to (legally) get us an English-subtitled version. Let me know. Continue reading A third film version of Jimmy the Kid? I have just received word that Donald Westlake died on December 31st, 2008, of a heart attack. He was 75.